MIAMI — At the main entrance to the Miami Dolphins' stadium stands a statue of Dan Marino as a witness to a game-changing completion. But as players trickle in, early reviews are favourable. Fabric screens and temporary stands on three sides obscure most of the unused seats, creating a surprisingly cozy feel in the 65,000-seat stadium, where the capacity for tennis will be 13,800. The former site was across the street from the beach, and the scenic setting helped the tournament become the largest in tennis aside from the Grand Slams, before it began to lose lustre. 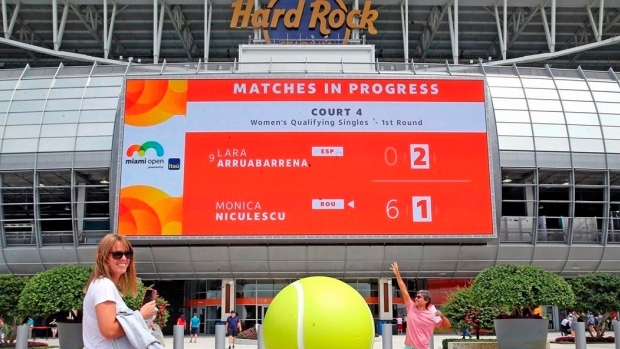 IMG, which owns the Miami Open, decided to move after a 2015 court decision prevented badly needed upgrades to the complex. He'll be in Miami this week to check out the new digs, as will most of the sport's other champions, from Serena Williams to Naomi Osaka to Novak Djokovic. Sponsors are enthusiastic, according to IMG, and ticket sales are up 25 per cent over last year. For fans on a budget, grounds passes start at $15. The cost is higher for admission to the multisport mashup that will take place on centre court.